We provide the South and East of England with the best in construction and plant machinery, and product support. We are the main dealerships for Kramer and Kinshofer construction equipment for East Anglia, London and the South East. Power Plant have a fully equipped workshop with engineers trained to work on all manufactured plant. We can offer a full service and overhaul of your equipment. Our work shop and on site mobile team depend on our parts department, which carries a full range of service parts for most manufactures alongside a full range of Kramer spares. In addition to our dealership equipment and plant, we have a quantity of used plant machinery and equipment. 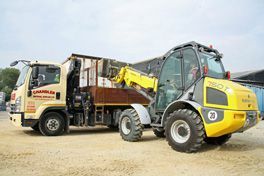 An Essex based builders' merchant has recently swopped its two ageing Kramer wheeled loaders for a pair of new models from the same German manufacturer.